Chef Jeremy Hansen has a new concept for Santé's space. It's the end of an era for one of Spokane's most celebrated restaurants. A little more than a decade after debuting as one of the most innovative dining experiences the region had ever seen, owners Jeremy and Kate Hansen plan to close their acclaimed flagship restaurant in the spring. 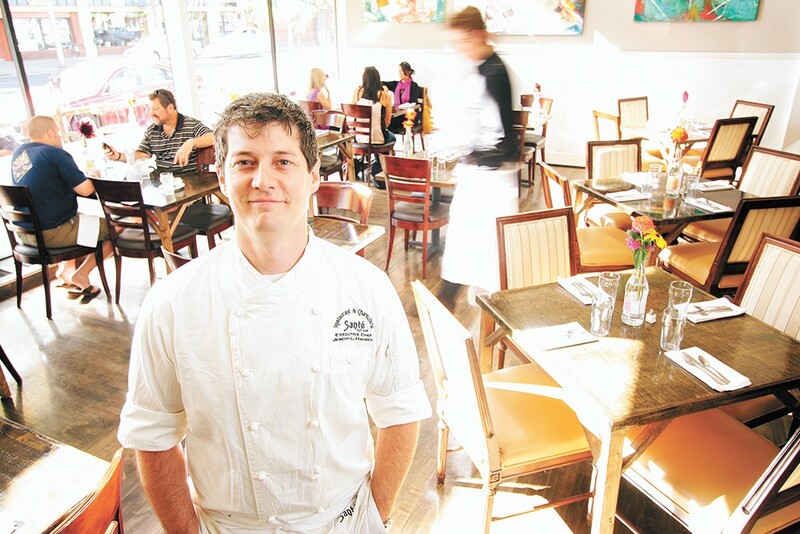 The decision to do so wasn't taken lightly, chef Jeremy Hansen tells the Inlander. "When we finally decided we were going to do this, it was very sad and in fact it took me like three days" to officially announce, Hansen notes. "And when I did, my heart kinda sunk, like 'Man, that's it; it's out there, it's over.' And we could keep it going, but I don't want to force it." The couple's reasons for closing Santé are many, but largely center on slower sales, paired with the fact that the chef's attention is now divided between numerous restaurants, among them the experimental small plates spot Inland Pacific Kitchen, along with Common Crumb Bakery (currently closed and being redeveloped) and Biscuit Wizard, both inside the Saranac Commons. Hansen also cites the rising cost of quality ingredients and wages, and a need to focus on family and a new baby at home. "Another reason is that Santé isn't as approachable to all of Spokane, which I really wanted it to be since day one," he says. "I don't want Santé to try to be what it's supposed to be when it really can't be anymore." The couple won't leave Santé's home inside the historic Liberty Building entirely behind, however, and plan to launch a new restaurant there after its closure. To be called Smoke and Mirrors Saloon, the new eatery will serve more casual, approachable fare, with all menu items under $20, including gourmet burgers, meatballs and other house-cured meats, a remnant of Santé's whole animal butchery program. Craft beer and cocktails will be a major focus, too. "I think it's good for the location and for downtown and for us and the community," Hansen notes. Until then, Santé will remain on its regular schedule as it goes out in style with several lasts, including the upcoming New Year's Eve dinner, and Valentine's Day. Starting in January, guests can relive an updated version of Sante's very first opening menu. For the restaurant's last run in Inlander Restaurant Week (Feb. 22 to March 3), he's planning a preview of Smoke and Mirrors. After Restaurant Week, Sante's 60th and final menu will be served for about a month. The original print version of this article was headlined "A New Era"